CHICAGO - July 26, 2016 - PRLog -- Doodle Art Alley Books is pleased to announce the release of a new coloring book for all ages that is sure to provide lots of summer smiles. 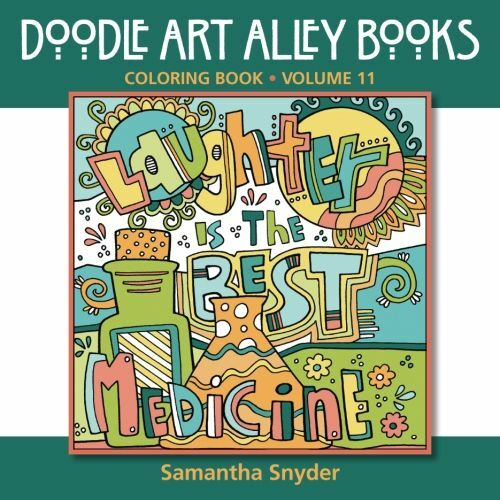 Laughter Is the Best Medicine: Coloring Book by Samantha Snyder (paperback, $9.95, 8.5 x 8.5, 104 pages, ISBN: 978-0997102178; August 1, 2016 official release) shares 50 doodle art images of inspiring proverbs, quotes, and sayings printed on one side of the page for all ages to color. Quotes from famous authors include Aristotle, Benjamin Franklin, Eleanor Roosevelt, William Shakespeare, Mark Twain, and more. The book also includes sayings from "Always find a reason to smile" and "Don't forget to smile" to "Everyone smiles in the same language" and "Every survival kit should include a sense of humor." According to Samantha, "A quick glance at a doodle may show scribbles, random lines and shapes with no meaning or significance. However, with a little love and direction, these drawings have the potential to compete with some of the best artwork there is! Doodling is so much more than simply drawing on a post-it or unconsciously scribbling on your notebook paper during an especially boring lecture. With the right care and approach, beautiful pictures can be created. Geometric and abstract designs along with wonderfully detailed artwork can grow from one simple, single line. Even emotional and mental healing can stem from a tiny little mark. The ideas and creative pathways are endless." The Mom's Choice Awards® has selected Doodle Art Alley Books as a Gold Recipient, including Imagination Will Take You Everywhere, Mistakes Are Proof That You Are Trying, and Attitude is Everything as among the best in family-friendly media, products and services with a Mom's Choice Awards Honoring Excellence Seal of Approval. AKA Associates is the publisher of the award-winning Doodle Art Alley Books Series of coloring books for all ages. Samantha Snyder is the author and illustrator of books in the series as well as the founder of Doodle Art Alley. While teaching elementary school, she often drew up coloring pages and printables for her students and fellow teachers. She decided to start sharing her creations and in 2008, Doodle Art Alley was founded. Doodle Art Alley is dedicated to giving doodles, scribbles, random lines, shapes, and squiggly lines the proper credit they deserve. For more information visit: www.akabooks.com and www.doodle-art-alley.com. Doodle Art Alley Books are available at Amazon, Barnes & Noble, and Independent Bookstores.